I cannot say enough good things about the Belle Voici a Capella Ensemble. This small group of professional singers leads the way in creating an effective environment where the broader community can be introduced to the best of sacred polyphony and choral music. Further, some of the generous members give of their time in lending their voices to help bolster local choirs for special liturgical events. This makes a big difference in the local church and community. The truth is, such ensembles play a major role in introducing the best of sacred music to the community at large while also helping to shape and form the next generation of professional conductors and competent musicians. It goes without saying a great part of the musical inheritance of the human race has been given us by the Catholic Church. This art is definitely something to share. It is a powerful tool of evangelization. The Church is keen to use musical art as a tool, on many fronts, since the very essence of art is to present the invisible in visible form, the indefinite in the definite. At the same time musical art needs religion if it wants to penetrate the very mystery of existence and so fulfill itself. 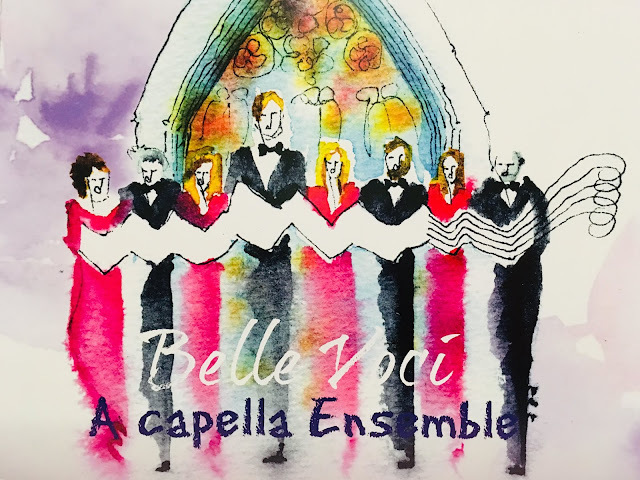 Belle Voci sings hymns in many languages. However, their voices soar in a special way when they sing in the choicest of musical languages, Latin. Latin is the universal musical language. It is important for communities to be introduced to this. Latin's optimal musical status is on account of its vocal richness and melodic flow and because of its rhythmic fullness. In fact, it has been shown Latin can be better and more stereophonically heard than English. Further, Latin is better suited than vernacular languages in the area of musical meter, prosody, declamation, idiomatic expressions, sentence structure and tonic accent. So thank you, Belle Voci! Keep singing and remember the words of the Vatican Council: "The musical tradition of the universal Church is a treasure of immeasurable value, greater even than that of any other art" (Constitution on the Sacred Liturgy, article 112).